To be very clear – of course, supply chains do exist; and naturally, there is an absolute need for the different organizations that form the chain to cooperate in order to ensure that value is created and sustained. As we learn more about the behavior of chains we also need to be prepared to look at them in a new light. A chain that wants to be successful in a sustained fashion does need to work on three aspects. These are firstly its own internal processes (1), secondly the cooperation with the respective up- and downstream elements of one’s chain (2) and thirdly the way value is created and shared (3). It has been my experience that most energy appears to be going into (2), some effort into the creation aspect and very little into the sharing aspect of (3) whilst internal processes (1) are taken in the main as given and if work is undertaken to optimize them, then it is typically done in isolation. Yet without internal processes within an organization being correctly optimized, it is literally impossible to create sustainable value for one’s own organization, let alone the chain as a whole. Value creation within one’s own organization is the starting point for future participation in a successful value chain. I will therefore focus here on the issues within an organization that represents one’s own link in any chain which will lead to the introduction of a new concept – the Value Braid. Whenever value chains are discussed in the literature, the focus is placed on chain performance and the need for participating links to work hard at ensuring that as product gets passed from one link to the next, effectiveness and efficiency are maintained without loss of momentum. The reality is that this concept relies on the links themselves being organically optimized. A value chain that works well can be compared to a well oiled machine that benefits from regular maintenance to ensure the engine runs smoothly, gets a regular oil check and is tuned as required. If this concept is accepted for the overall chain performance, it follows that a similar approach is advisable to ensure the robustness of individual chain links. Dealing with an individual link is by default more specialized than dealing with the chain at large because if individual links are ineffective, the chain as a whole will not work properly either. It is therefore critical that the composition of individual links is better understood than is currently the case. A successful value chain resembles a yeast braid, which is constructed from individual strands. If the dough used to bake a yeast braid is not kneaded enough, it will not rise properly. Dough that does not rise properly will not turn into a well baked yeast braid. A well baked yeast braid consists of five strands, expertly woven together by the baker’s hands. If the five strands are not woven together well, the yeast braid might taste ok, but will present as messy, crooked and out of alignment. The five strands that form the link an individual business represents in the value chain are customer focus, quality status & management, information capability, communication skills and physical product movement. Each strand will be briefly discussed to assist in explaining the nature of a value chain link – or Value Braid. The purpose of a value chain is to satisfy customer needs. Each link in the chain needs to focus on four categories of customers. These are its suppliers, its direct customers; i.e., the next link in the chain, the ultimate consumer and the internal customers (such as team members) within the link itself. Each group of customers has its own needs, its own pressure points and its own set of rose tinted glasses. Unless their needs and aspirations are understood and aligned, value creation is next to impossible. Quality is a concept discussed ad nauseam, written about extensively and not well understood. Some years ago I introduced the concept of interactional fusion quality. This was based on the realisation that produce of good quality had the potential to be of average or poor quality by the time it has passed through the supply chain if the journey either took too long or if the handling processes along the chain were questionable. Similarly, produce of questionable origin entering the supply chain would not improve through travelling along a well designed, managed and skilled supply chain. The law of perishability does not allow for such eventualities. Quality management is not a destination or a point in time, but a never-ending journey and must be treated as such. The paperless world has yet to arrive but we are increasingly becoming dependent on electronic communication for just about all aspects of produce moving from grower to consumer. Living in a market economy means that not every IT system in use is the same. Many ‘off the shelf’ systems pronounce ‘connectivity’ as one of their virtues, referring to their supposed ability to connect with other proprietary systems up and down the value chain. How much data do we want to share though? How much data do we need to share? At what point in the process should data be shared? In which format should shared data be presented? How can we protect our data from abuse – and to what extent does the shared data need to be ‘translated’ in order to meet the needs of our customers? These are just a few questions for starters. The point being that technical capability alone is no longer enough. How we manage data is getting just as important as whether we can cope with the technical aspects of data transmission. The ability to communicate well has always been one of the mainstays of building and maintaining good business relationships. Competence in the areas of accuracy, timeliness, relevance and sufficiency from both content and process perspectives are paramount in ensuring value is added rather than reduced as produce moves through the value chain. What constitutes ‘sufficient’ information though? How much reliance should we place on automated data collection as opposed to the good old fashioned human approach? 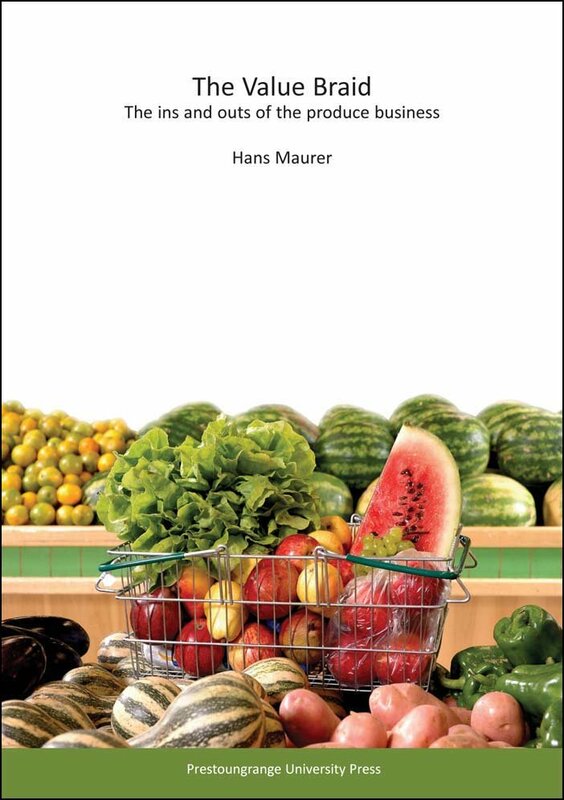 Can identical communication models be applied to all fruit and vegetable sectors? And if these questions were not enough – do we need to consider the role of social media solutions such as Twitter to reach our customers? This aspect always appears to work well in any business. After all, I must be doing something right if I can get my tomatoes to my wholesaler every day in one piece? Indeed, but what improvements could be made? To what extent is physical product movement impacted by the information needs of my customers? Could I save money by sending the truck earlier? Or later? Or getting my neighbor to deliver on my behalf? Does it make a difference whether I am sending my produce to a wholesaler, to a retail distribution centre or direct to a consumer via an e-Bay or Trade Me listing? How do I keep my product moving and how do I integrate this strand of my vale braid with the other four? Think of the yeast as the magic ingredient, your unique selling proposition, the critical core competence that differentiates your product or offer from that of your competitor. It does not matter how well a braid has been assembled, if the yeast is missing, the dough will not rise and the braid will not achieve its potential, regardless of how long it is kept in the oven! The same applies to your business. What is your ‘yeast’? Your ‘yeast’ ultimately underpins the success of your business, as evidenced by the degree to which you are able to have the five strands of the braid working in harmony as the business connects with the respective up- and downstream elements of your value chain. A paradigm shift is needed in the way we think about our business. Before we can successfully participate in supply chains or value chains, we need to ensure the link our business represents is optimized – and that link is called the Fruit Trade Value Braid.